Do you know what secrets your computer could reveal about you? Anybody with access to your computer and a little know how can quickly find a list of all the web sites you recently visited, any photos or music that you may have downloaded, they could read though your chat conversations and even easily recover deleted files. If you don’t want your private information to become public knowledge you need Smart Privacy Protector. Smart Privacy Protector finds and removes the history of all of your recent web activity including recently visited websites and any downloaded files or photos. Cookies that have been automatically downloaded will be tracked and removed along with information about recently opened documents and any document searches. Important documents can be shredded to make sure they are 100% unrecoverable. 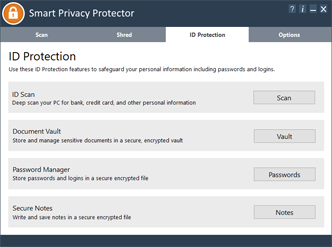 If you’re concerned about keeping your computer activity private and secure then you should try Smart Privacy Protector. Smart Privacy Protector will find and remove the history of recently visited websites, tracking cookies, traces of downloaded photos, video or music files. Finding and removing this information manually could take hours and you still run the risk of missing something important. Running a scan with Smart Privacy Protector removes all of these threats instantly. Entire chat histories are stored by your computer. Smart Privacy Protector finds and removes all traces of your conversations so that your information remains 100% private. Smart Privacy Protector scans and removes the history of recently opened documents, empties your recycle bin, removes temp file and cleans up other windows privacy risks. Removing all of this information frees up valuable disk space and also helps improve the speed of your PC. Increase your security even further by using Smart Privacy Protector to shred important files you don’t want anybody to recover from your computer. Smart Privacy Protector offers 3 levels of shredding. Shredding is a process of overwriting the information in a file a certain number of times to ensure that data recovery products will not be able to restore those files. Like all of our products, Smart Privacy Protector is designed so that even the most novice computer will be up and running instantly. Our easy to follow interface makes it easy to immediately find and remove all possible privacy risks. To ensure that you don’t accidentally delete important files Smart Privacy Protector selectively scans your computer excluding exe files and other vital program files. If you have files or cookies that you would like excluded from future scans then Smart Privacy Protector makes it easy for you to add them to an exclusion list. In just minutes you can scan your computer and remove all possible privacy risks. 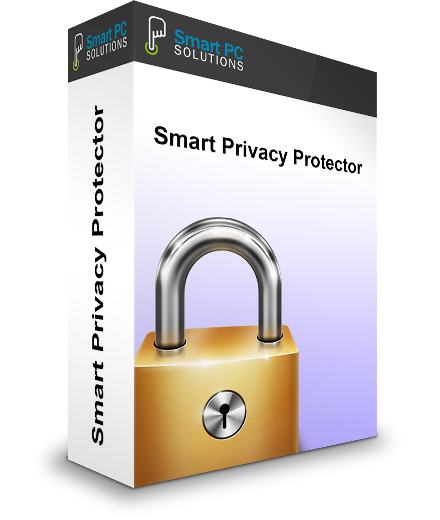 Smart Privacy Protector is the easy way to keep your private information safe and secure. Deletes internet search histories and recently viewed web pages.